If your company decided or needed to seek re-permission for email sends you will now be witnessing the major impact on your database volume. For some brands, this will be a reduction of more than half their existing send base. On the plus side having a smaller, but more engaged list will create better open, click and conversion rates than before. However, as email provides such a great Return on Investment (£32.28 back for every £1 spent according to recent DMA research*) and when used properly, creates real brand engagement, it’s a clear objective to grow your email send volume. Note: I’m NOT saying you’ll get double the revenue from double the send, but you will see significant uplift from increasing your ENGAGED mailable data. 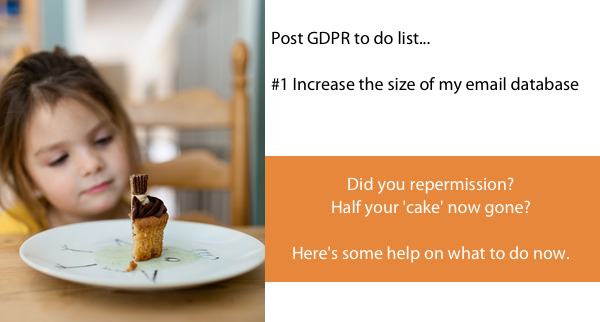 So, to give you some hope post GDPR, here’s 3 steps to help create your acquisition strategy. We all know we should be doing this anyway, but now it’s a priority. Here at Twist we’d love to help you with the ‘HOW” so please do get in touch.